Not only have high-fiber, papaya also contain different types of enzyme, vitamins, and minerals. Even the womb to its vitamin A than carrots, and vitamin C is higher than the orange. 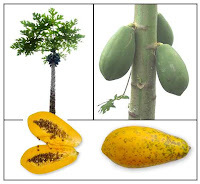 Also rich with vitamin B complex and vitamin E.
Papain compound inside fruit, leaf, root, and sap of papaya can be used to prevent interference kidney, bladder pain, high blood pressure, and menstrual disturbances. While useful papaya seed treat worm bracelet, indigestion, flu, and diarrhea. Papaya also rich with karpain. karpain is also hinders the effective performance of some of the microorganisms as possible digestive function, so effective for the cause of typhus. Here are some herbal ingredient examples made from papaya. As a body refresher, take two pieces of roots and leaves of a papaya. Both materials are pounded finely, and then boiled with a liter of water until boiling, then filtered. If necessary, Mix ginger or honey so that it seems more fresh. To prevent the risk of kidney stones, take three pieces of the root of papaya, and boiled with a liter of water until boiling, then filtered. After a cold, mixed with a little honey, and drink. To cure inflammation and itchy on skin (as a outside medicine). Apply the sap from the young papaya fruit. So that infection does not occur, clean the skin before the first be oiled. As a controller of blood pressure, take 5 pieces of papaya leaves, boiled with 1 / 2 liters of water to stay three four. Cooling down before you drink. If necessary, add brown sugar or honey in order to feel sweeter before you drink like a tea. To cure dengue fever, mixed leaves 5 pieces of papaya, temulawak rhizome (Curcum xanthorriza), meniran(Phillantus niruri L.) as much as needed, and palm sugar. Boil until cooked and then cooled before ready to be drunk. Stomach pain medicine during menstruation, take 1 sheet of papaya leaves, tamarind, and salt as much as needed. Boil until cooked and then cooling down and drink in a glass. To facilitate mother breast milk, the constipation, menstrual disturbances, and stomach trouble, take advantage of the papaya fruit as a vegetable base material. Vegetables papaya fruit is usually cooked as a vegetable soup. As a distraction, it can be mixed with meat or Sorbian cake. Do not forget, before cooking, washing fruit to clean the dirt and reduce its sap. To improve Feed fiber that helps maintain digestive organs at the same time facilitate defecate. Can be eaten directly or made with mixed fruit juice and other sugar or honey added.